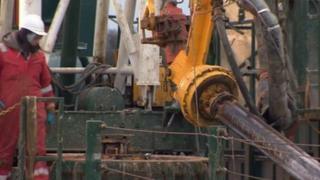 An energy company has begun what it calls a "wildcat drilling operation" for oil in East Yorkshire. Rathlin Energy is drilling an exploratory well on the outskirts of Bishop Burton, near Beverley. The Canadian company has previously carried out studies in the region to determine where oil and gas might be found. A spokesman said the chances of finding commercially viable reserves in the area were about 10%. Commenting on the financial risks involved, David Montagu-Smith, chairman of Rathlin Energy UK, said: "This is a high risk operation, we call this a wildcat drilling operation. "We will be here on the site for another six or seven months perhaps, and then if we are not successful we will be gone and we'll restore this land to the condition it was in so no-one will ever know that anyone has been here. "The North Sea is now depleting quite hard. We now import more than half of the gas this country consumes. Anything domestically we find is obviously going to make a contribution." Raith Energy also has planning permission to drill another temporary well near Skirlaugh. Planning permission was granted by East Riding of Yorkshire Council in June, despite objections from some residents. Bill Rigby, from the Hull and East Riding Green Party, said: "It beggars belief. The whole of East Yorkshire has been parcelled up by the government as a gift to these exploiters. "It will have a serious impact on climate change and will offer no future at all for the community at large, leaving behind a whole wreckage of pollution and so on."